This week Csa’ers will choose from: onions, lettuce, spinach, chard, kale, broccoli, beans, tomatoes, canteloupe, corn, peppers, eggplant, parsley, dill, cilantro and basil. This week was pretty much the same as last week. We harvested, we weeded and we complained about the mosquitos. In June I told Kitana and Nicole that by July the mosquitos would be gone. Then July came and I promised them by aug the mosquitos would be gone. It’s now almost september and they’ve been wearing their rain suits all summer and they’re starting to doubt me when I say that for sure by september the mosquitos will be gone and are threatening to quit if the mosquitos aren’t gone by November. 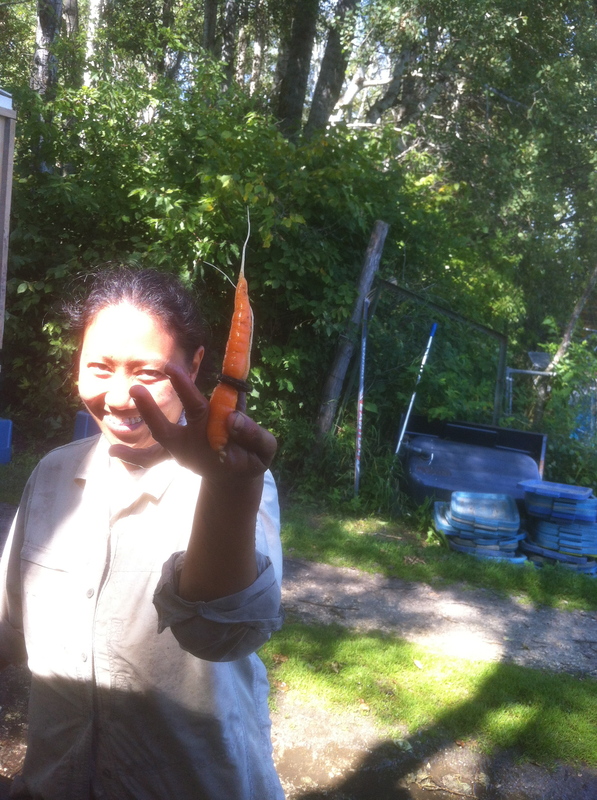 Kitana made an interesting find last week: a carrot which grew through a ring (washer) in the field. So whoever finds this carrot gets to marry Kitana. Kitana’s also taken to cuddling with chickens which may be why they hang around so much. Unfortunately I don’t have a picture to show you of that. We’re into more full heads of broccolli. The earliest planting of fall broccoli is mature. It’s a little earlier than I had planned, but it’s just as good now. It may be offered as a choice with fall Kohlrabi. The fall kohlrabi is different than the spring kohlrabi in that it is supposed to be large, whereas the spring kohlrabi gets woody if it gets too large. I tried a giant fall kohrabi today and it was crunchy, juicy and delicious. Most of it will be saved for later in the season when brassicas taste the best. Above are the fall brassicas. 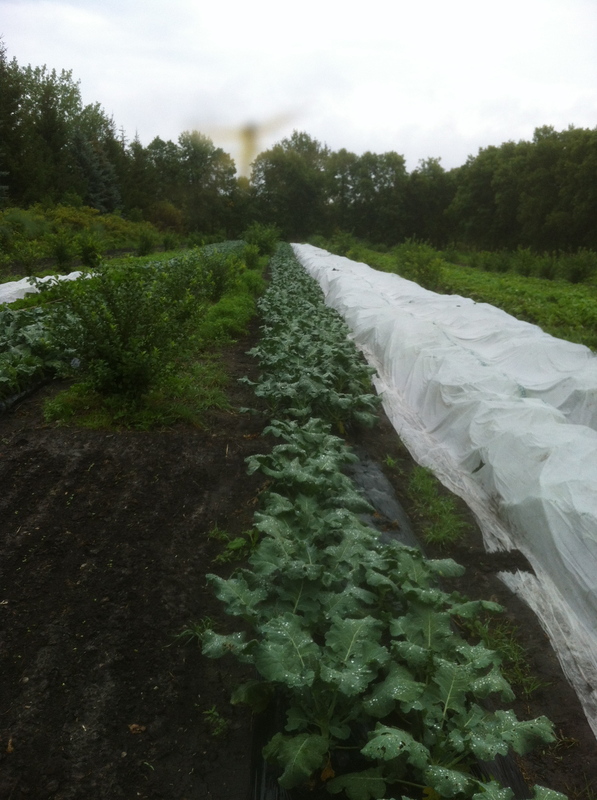 The cabbage is covered to protect it from the caterpillars. There will hopefully be more apples for sale from Kelvin Hildebrandt who is starting an organic apple orchard near Morden. There may also be apple cider from fruit share (just waiting for approval from the health inspector). There will also still be lots of corn from the corn guys.